Practiced again with Martijn tonight and I learned two things. Or actually, I knew them as a matter-of-course, but their importance was impressed upon me once more. The center line is what it's all about, both defensively and offensively. Having the line opens up many modes of attack which require much less effort to break open. Losing the line opens you up to plenty of attacks in a heartbeat. Speed. I need to develop it. Not only do I need to stop waiting things out and spend X amount of seconds thinking and looking, but I also need to make my movements much faster. Halfway through our practice I decided to up the ante a little bit, to get more pushy and to get faster. BAM! Martijn pours on the speed as well and I'm lost. It showed so very, very clear how much he's been holding back so far. As I said before: I'm becoming lazy. Instead of chomping at the bit for more kendo practice I was actually trying to find excuses to cancel last night's practice. I'm glad that Marli didn't let me and that Martijn was showing such enthusiasm :) If anything, last night's exhaustion tells me that I still love kendo and that I really do need to keep up my practice (both in running and in kendo). So that's one lesson learned, but what else was there? As always, I need to learn how to think aggressively. Stop the endless waiting and thinking ("What'll he do? What'll he do? Will he strike? Should I strike? Where should I strike? How about small men?! No, he already expects that!") and create my own chances. Create an opening (or find one), strike and push through. Push through! Push even if your strike failed. Do not, I repeat, DO NOT skip backwards, back into kamae! Lunge, strike, follow through and move! And if the opponent doesn't let you pass, go for tai atari. When my shinai is pushed out of the center line, I push back. When this is done repeatedly, all the opponent has to do is release tension on his shinai and bingo! My sword swerves waaay to the other end and there's an open kote target. When opponent goes for my men, I raise my shinai to deflect. However, I raise it too high and too far to the right, so again that's an open kote. With many attacks, instead of parrying and countering, I simply brace for impact. Last night, despite muscle aches* and tiredness, Martijn and I got together for another training session. After stretching and a little suburi I followed Menno's advice and decided to forego any real focus on the small/fast men strike. First off, Martijn was interesting in practicing jodan no kamae, which is a completely different stance than is normally used and taught. Whereas chudan no kamae is both safe and stable, jodan has both drawbacks and positive sides. For example, while extending the kendoka's reach considerably (at least half a pace), the raised shinai leaves both the do and the left kote open for attack. 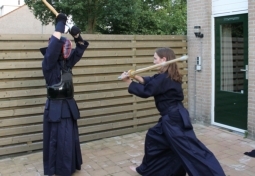 With Martijn having practiced some men strikes from jodan we then proceeded with something that I could use more of: jigeiko. With Martijn wearing his bogu it was up to me to practice seme and to create an opening for myself. 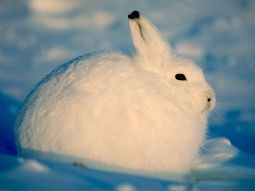 As I already know (and as Martijn remarked yesterday) I'm about as threatening as an arctic rabbit, so this is good practice for me! Gaining the center line through pressure and footwork. Harai waza, flipping the opponents shinai aside. Maki waza, twisting the opponents shinai away. Hiki waza, striking when jumping backwards from taiatari. Getting struck on the do doesn't hurt at all, unless it misses :p The kote strikes were a bit sharp and the men hits were pretty... interesting, that's the word.